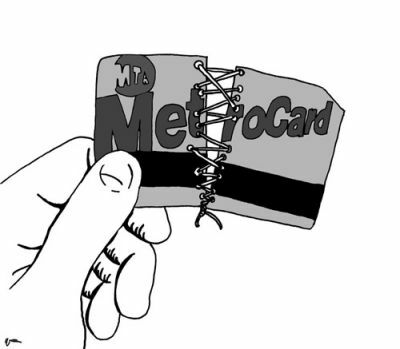 The next time you purchase a monthly Metrocard, which is slated to increase to $89 at the end of June, think about this: Almost one-third of the money you spend — about $29 — will go to service the Metropolitan Transportation Authority’s massive $26.8 billion debt. This simple fact indicates why the Metropolitan Transportation Authority (MTA) is in perpetual crisis. The MTA will spend nearly $1.5 billion to service debt in 2009, and it projects debt servicing will swallow up an average of more than $2 billion a year from 2010 to 2012. Wiley Norvell, communications director for Transportation Alternatives, says the reason for this debt load, reportedly the fifth largest of any state or local government body in the United States, is because the MTA pays for improvements “on a credit card.” Norvell explains that “the city and state have stopped contributing to the capital construction,” leaving borrowing as the main source of funds for new transit projects. The MTA breaks down expenditures into operating and capital. The capital budget pays for expanding and building subway lines and stations, purchasing new subway cars and buses, maintaining signals and communications and related activities. The operating budget includes salaries, health and pension benefits, fuel and electricity and cleaning trains and stations. John Petro, urban policy analyst at the Drum Major Institute for Public Policy, wrote in a recent report that while New York City and State funded 30 percent of the MTA’s capital budget in the mid-1980s, by 2004 that support had declined to just 3 percent. Because the city and state provide so little capital funding, the MTA issues bonds to fund new projects. To make the bond payments, it uses revenue from both taxes and the fare box — money that would normally be part of its operating budget. That fare box is shrinking because of the severe U.S. economic downturn. In a press release dated April 27, the MTA predicted “increasing unemployment and higher fares” would lead to a “7.2 percent drop in usage of its facilities in 2009.” It noted that even after approved fare and toll increases, it expected revenue from these sources to fall by an additional $221 million this year. But this shortfall pales in comparison to plunging real estate transaction taxes, which are a major source of income for the MTA. The collapse of the real estate bubble has virtually wiped out this source of funds. In 2007, the MTA raked in $1.6 billion from real estate transaction taxes. Last year, it collected only $995 million, however. According to an MTA press release dated April 27, projected real estate tax revenue will plummet to $544 million in 2009. But even this looks optimistic. According to an MTA spokesperson, the authority took in a paltry $161 million from the real estate transaction tax through the first five months of 2009. Norman Brown, legislative director of the New York State Council of Machinists and a nonvoting member of the MTA board, argues that the MTA is overly dependent on revenue generated by the real estate industry. 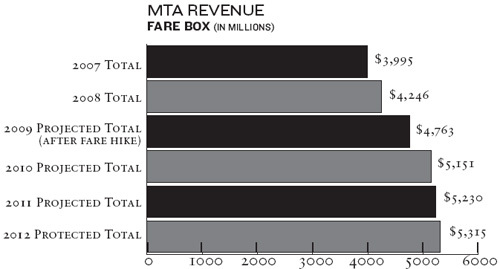 Earlier this year, the MTA reported that it was facing a $1.8 billion budget deficit for 2009 due to declining revenue. To close the gap, the MTA warned of a “doomsday scenario” involving fare hikes of 23 percent and drastic service cuts that would eliminate two subway and 35 bus lines. In May, Gov. David Paterson and the state legislature agreed to raise $2.26 billion, mainly from an increase in payroll taxes, to prevent the doomsday scenario. As part of the deal, $400 million a year will go to fund the MTA’s capital projects. But the agreement mandated a 10 percent fare increase to go into effect June 28, and two more fare hikes of 7.5 percent each for 2011 and 2013. Since 2003, the price of a single subway or bus ride has leaped 50 percent to $2.25. Additionally, a proposal to institute tolls on the East River bridges that could have generated an additional $600 million a year was killed by the state legislature. The announcement from Albany may have been a relief to straphangers, but many observers say New Yorkers are still faced with a transit system teetering on a financial precipice and beholden to powerful corporate interests. New York State’s MTA is the largest provider of mass transit in the Western Hemisphere. It includes more than 840 miles of subway tracks in New York City; two major commuter rail lines, the Long Island Railroad and Metro-North Railroad; seven bridges and two tunnels; and approximately 380 bus lines. It serves 8.5 million riders and more than 800,000 vehicles on an average weekday. The number of riders who use the New York City transit system today is barely at the level of the 1940s when more than 8 million rides were recorded per day. By the 1970s, after decades of neglect, the subway became a symbol of the defunding of New York. Breakdowns, derailments and even collisions became commonplace. Starting in 1981, the MTA issued its first bonds, totaling $350 million, to repair and upgrade the system. The subways were improved significantly by the early 1990s, but the state completely eliminated its funding for capital projects by 1992. 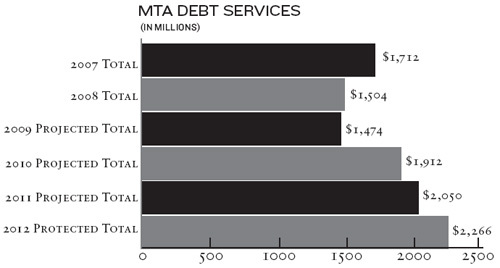 Consequently, the MTA’s outstanding debt reached $12 billion by 2000. Under Pataki, the MTA debt exploded. According to The New York Times, a deal to refinance the $12 billion debt — “recommended and structured by the former Wall Street investment giant Bear Stearns” — was enacted in 2002. (Bear Stearns reportedly walked away with $100 million in fees.) Critics blasted the deal. While the MTA realized short-term savings, it extended debt that would have been paid off in 2015 by another 17 years. A 17-member board of directors oversees the MTA. Each member is nominated by the governor and approved by the New York State Senate. Thirteen members each cast a single vote, and the remaining four, representing upstate counties, cast one collective vote. There also are six nonvoting seats held by representatives of organized labor and the Permanent Citizens Advisory Committee, which was created to give voice to transit users. The board’s powers include approving budgets, labor contracts, fare hikes and service cuts. Discussing the MTA board invariably brings up charges of corruption and patronage. Russianoff says Pataki “appointed very well-off people who raised contributions for him,” such as former MTA Chairman E. Virgil Conway. During Pataki’s successful run for a third term from 2003 to 2006, eight MTA board members contributed $135,760 to his campaign. The year he was appointed, former MTA Chair and real estate mogul Peter Kalikow and his wife reportedly donated $80,000 to Pataki. Meanwhile, Fitch revealed, Kalikow’s “flagship tower at 101 Park Avenue” rented space to at least three different firms and lobbyists that did business with the MTA. While wealthy developers and fundraisers are appointed to powerful positions on the board, six nonvoting board members represent the Transport Workers Union, the United Transportation Union and the Metro-North Railroad Unions, as well as commuter advocacy councils and organizations. Click here to read “Getting the MTA Back on Track” by Danny Valdes, in this issue of The Indypendent. The first underground subway opens in New York City. They were private ventures by two companies: the Interborough Rapid Transit Company (IRT) and the Brooklyn Rapid Transit Company, which later became the Brooklyn-Manhattan Transit Corporation (BMT). After 1913, New York City built or improved most of the lines and leased them to private companies for profit. 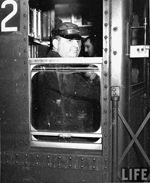 Mayor John Hylan forms the New York City Transit Commission (the forerunner of the modern transit system) with aspirations of building a city-owned-and-operated subway line. The city opens its first publicly owned subway, the Independent Subway System (IND). NYC transit workers organize and form the Transport Workers Union (TWU) under the leadership of Michael Quill. The TWU would later expand to represent transit employees in other cities, primarily in the Eastern United States. With the private lines reeling from the Great Depression, the city acquires both the IRT and BMT subways and begins to integrate them into the public system administered by the city’s Board of Transportation. Robert Moses successfully alters the legal structure of public authorities. They become state bureaucracies with the same privacy rights as corporations, along with the rights to raise their own police force and evict people under eminent domain. 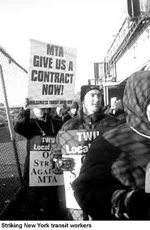 NYCTA workers strike after the expiration of their contracts and win a dollar-per-hour increase, an additional paid holiday and increased pension benefits. 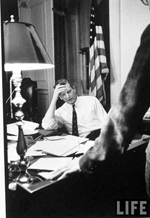 In response, state legislators pass the Public Employees Fair Employment Act (more commonly known as the Taylor Law), rescinding public employees’ right to strike. The NYCTA is placed under the control of the newly formed Metropolitan Commuter Transportation Authority (MTA), responsible for administering transportation throughout the state of New York. Known today as the Metropolitan Transportation Authority, it covers nearly every aspect of transportation — both mass transit and road construction — for the New York metropolitan area, including all five boroughs of New York City and its seven surrounding suburban counties. The 33,000 members of TWU Local 100 stage a three-day strike to fight MTA attempts to institute a two-tier pension system and to saddle workers with increasing healthcare and pension expenses.